The Oregon Department of Education released statewide high school graduation rates on Jan. 24, lauding a 2 percent increase from the 2016-2017 school year. Oregon had a graduation rate of 78.7 percent in 2017-2018 and saw rates increase among "underserved student groups" at a greater rate than the statewide average. Native Hawaiian/Pacific Islander students saw an increase of 6 percent while American Indian/Alaska Native students increased their graduation rate by 6.2 percent. Hispanic/Latino graduation was up 2.1 percent and homeless students graduated at a 3.4 percent greater clip. 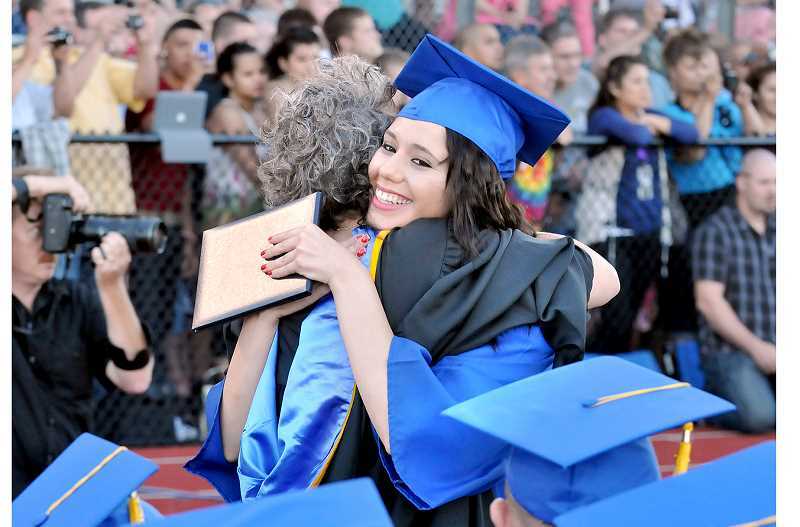 On the local level, Newberg High School graduated 83.99 percent of its students last year – more than 5 percent better than the statewide average and an 8.3 percent increase in the past three years. NHS interim principal Tami Erion said the steady increase of graduation rates is directly related to an increase in Career and Technical Education (CTE) course offerings as well as targeted intervention for at-risk students. Funding from Measure 98, Erion said, allows the high school to provide intervention services and improve its CTE program. "We were excited to see the increase in graduation rate for NHS," she said. "It is our hope that the Legislature fully funds Measure 98 for the next biennium. This would allow us to maintain our CTE course offerings and strategic interventions for students while potentially adding additional supports moving forward." St. Paul High School, meanwhile, graduated 100 percent of its seniors last year, up from 92.31 percent in 2016-2017. Although St. Paul's graduating classes are much smaller than the rest of the state, superintendent Joseph Wehrli said it's "exciting" to have every student graduate on time. "I think it's a special thing for the district," Wehrli said. "It's a lot of work for teachers, the community and staff – and the students themselves." "It's important to remember that we are talking about students, not statistics," Oregon Department of Education Director Colt Gill said in a release. "In this case, a two-point increase in graduation means an additional 950 students getting their diplomas within four years of starting high school. Under the leadership of Governor Kate Brown, we have enacted equity-focused supports that have helped students of color, students navigating poverty, and tribal students graduate at a higher rate than before." The ODE pointed to Governor Brown's proposed increase of $2 billion in education funding as a way to further increase graduation rates. Brown's proposal – according to the release – includes $794 million to reduce class sizes in early grades and lengthen the school year, $133 million to fully fund the High School Success (Measure 98) program, $7.7 million for Native American student programs and a $6 million increase for the African American/Black Student Success program. Oregon's high school graduation rate is lower than the national average of 84.6 percent, which was last measured in 2016-2017. "How our state provides for the needs of our children is a marker of who we are as a community. Every student in Oregon deserves an education that sets them up for success and helps them graduate from high school with a plan for their future," Brown said in the release. "These graduation rates show our work to close opportunity gaps with targeted investments is making a difference in the lives of students. To build on this progress, I am dedicated to re-investing in our schools to bring them back to a level we can be proud of." For more information on graduation rates from around the state, visit www.oregon.gov/ode/reports-and-data/students/Pages/Cohort-Graduation-Rate.aspx. "My family didn't always have a lot of extra money when I was growing up, so I know that financial considerations can be important to making sure students from all walks of life can access this educational opportunity," Merkley said in a release. Support Newberg High School grad night with a fundraiser from 5 to 10 p.m. Jan. 31 at La Sierra Mexican Grill & Lounge in Dundee. Twenty percent of the proceeds go to NHS Grad night, the drug- and alcohol-free party that follows NHS commencement in June. Another fundraiser benefitting Grand Night features breakfast from 8 a.m. to noon Feb. 10 at St. Peter's Catholic Church. Cost of attendance is $6.